The Nikon D5300 Digital Field Guide is filled with everything you need to know to take fantastic photos with your new Nikon. 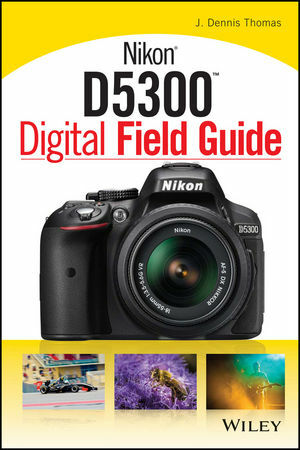 In full color, this portable guide covers all of the essential controls, features, and functions of the Nikon D5300, using step-by-step instructions and providing full-color images of each menu screen. Nikon users will love this comprehensive field guide—it's just the right size to fit into a camera bag, so you'll be able to take it wherever your photography adventures take you. Filled with amazing examples, this handy guide offers a variety of tips and tricks. You'll learn how to capture portraits, take character-filled candid shots, frame sports action, document travel, work with macro photography, and much more!